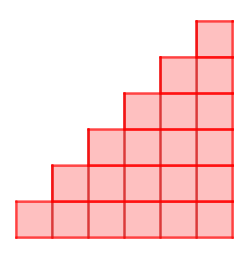 Triangular numbers can be represented by a triangular array of squares. Imagine two copies of a triangular array of squares. Can you picture how to fit them together to make a rectangle? What is special about the dimensions of your rectangle? Use the activity below to test your ideas. What do you notice about doubling triangular numbers? Experiment with different triangle numbers and explain what is special about the rectangles made from two identical triangle numbers. Can you write down the dimensions of the rectangle made from two copies of the 250th triangle number? Can you use this to work out the 250th triangle number? Deduce a strategy for working out any triangle number. Consider the following numbers: $4851, 6214, 3655, 7626, 8656$. Do any triangle numbers end $000$? You may wish to try the problems Mystic Rose and Handshakes. Can you see why we chose to publish these three problems together? Working systematically. Interactivities. Triangle numbers. Generalising. Visualising. Creating and manipulating expressions and formulae. Cubes & cuboids. Curious. Games. Mathematical reasoning & proof.